This is a short but sweet tale. 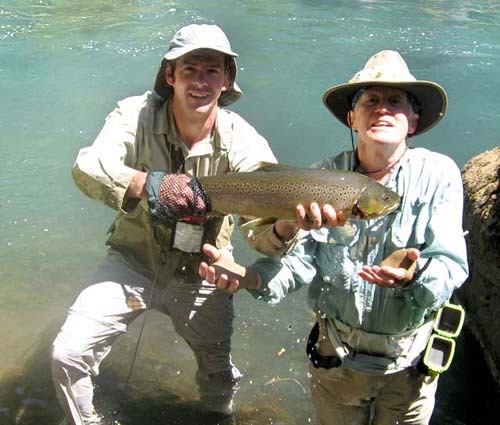 Fishing a deep pool of the McCloud with my brother Brian near Ash Camp with guide John Rickard, Brian hooks into a 12" bow drifting a nymph under a dry. A submarine comes up from the depths and engulfs the bow. Our eyes collectively pop and Brian reflexively jerks the bow out of the the submarine's mouth, lending a new and richer meaning to the term "catch and release." It was gone but we all agreed we had seen it. We scolded Brian about bait fishing in the McCloud. A few minutes later I am drifting a two nymph combination under an indicator in the same pool. The indicator goes under and I set the hook. It seemed to be a snag, but then the snag started moving. I settled in for the fight. How long would it last? Was it gong to end in tears? The pool was big enough for an upstream run which I got stopped. This was followed by some deep diving trying to rub the fly loose against some rocks. My hope was he was hooked on the upper fly which was 4x tippet rather than the trailer which was 5x. It was the trailer Then I got a couple of spectacular all out the water leaps to try and throw the hook. By then he was tiring some and there was some possibility of landing. John is young, strong and very agile--he's recently retired for professional bicycle racing. He got into the water in one of the two possible landing places in the pool and the fish gave us an opening. It was bigger thean the net he was carrying so netted its head and tailed it using one those Seth Norman hand nets--see his right hand in the picture. He was ours, all 32 inches of him! High fives all around and the customary '"grip and grin" pictures were taken with several cameras, and then we released him to fight again. Then the adrenaline after-effects hit. It was some time before we were ready to fish again.